Rheem have a very good reputation when it comes to service related issue have one arise. They generally come out the next day. 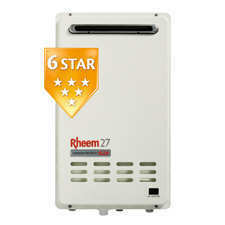 Rheem 27 is our highest capacity continuous flow gas water heater. With 27L/minute capacity it can deliver that little bit of extra hot water when you need it. It’s perfect for large families with limited space, but big demands for hot water. Rheem 27 can save you money — 6.1 Star energy efficiency means you can save on gas bills. Temperature limited 50°C & 60°C models available.